1st Stage: 5-Micron 10" PP Sediment Filter Cartridge 2.5x10" (replace every 12 months); removes dirt, suspended particles and rust. This system comes complete with an installation pack, color-coded tubing, and filtration cartridges, . It comes with lead-free Mini Modern Water Faucet OR lead-free TouchFlo goose neck faucet with chrome finish. 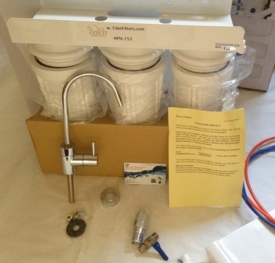 The installation pack includes feed water valve, inserts and screws in addition to the installation manual. Once water has been filtered, desirable minerals like magnesium, calcium, potassium are left behind in water. If you have specific contaminant that you want to remove from water then you can buy a Specialty Filter Cartridge and install it as Stage 2. For example, if nitrate is the contaminant of concern, then buy a Nitrate Removal Filter Cartridge to remove nitrate from water. If the water is not chlorinated and it is not always bacteriologically safe, then we suggest that you buy the FS3-UV system. UV will sterilize microorganisms going through the three filtration processes. Please note that a reverse osmosis system will remove all contaminants from water. Other ideas: If you are concerned about hydrogen sulfide, then buy KDF85/GAC cartridge for Stage 2.